[CONFSERVER-33616] Autocomplete does not find predefined groups when sharing a page - Create and track feature requests for Atlassian products. 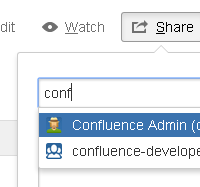 Confluence does not recognize the groups confluence-users and confluence-administrators when trying to share a page. The page share autocomplete does not find the group at all. --> The list of groups does not include confluence-users. This works fine for user created groups.